This easy Chicken Piccata Casserole recipe brings in all the delicious flavors of the classic Italian meal and makes it into a super quick, easy, and delicious one dish dinner. 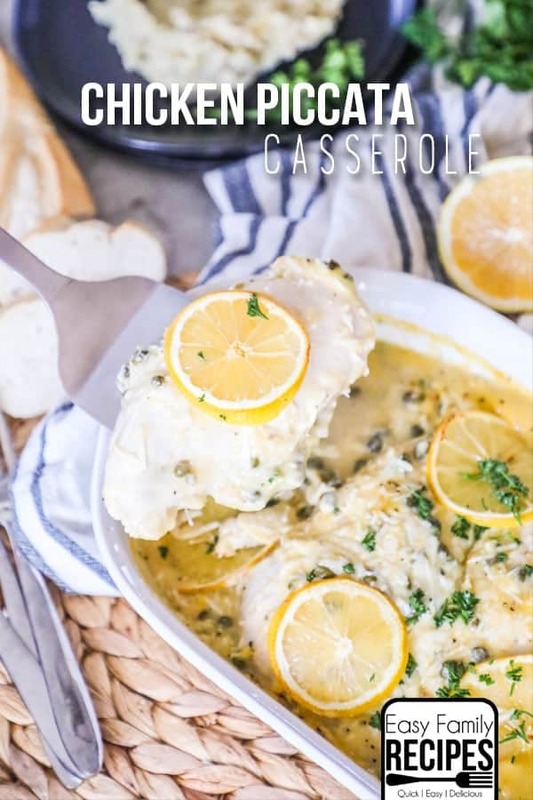 It has all of the richness and tangy lemon flavor of the Chicken Piccata from your favorite restaurant but is simple to make even on the busiest of week nights. This is a hit with the youngest to the oldest in our family and I hope it will be for yours too! Chicken Piccata has been one of my favorite meals for a LONG time! I used to only order it at restaurants, and eventually I learned to make it at home but it still takes a little more time and effort than I have to give on the average weeknight. When it came to figuring out what recipe I should share with you next, I started thinking how I could make chicken piccata easier so it could be something I could make more often. I had a few ideas and started playing around in the kitchen. There were lots of ingredients, lots of trials and a few errors that we don’t want to speak of again. In the end though, we came out with a super creamy, perfect lemony casserole. While it is nowhere near authentic, it does do a really good job of taking those delicious flavors of classic chicken piccata and packing them in a WAY easier to make package. Or you can see a big list of my favorite baked chicken recipes here! The great thing about this meal is that the main part is baked all in one casserole dish. You can pair it with a couple of simple sides and have an awesome dinner on the easy. You can go with classic options, low carb options or a couple from each. It’s up to you! Mashed potatoes- These are my favorite Mashed Potatoes! These are lighter, but in every case, just as delicious to serve with Chicken Piccata! My personal favorite is the sauteed spinach, and my husband loves putting the chicken piccata on a bed of mashed potatoes and smothering it with sauce! If you have a favorite way to serve it, make sure to leave me a note in the comments so I can try it out! As I have mentioned a few times, the absolute best part about this dish (next to the taste of course!) is how easy it is to make. I am going to walk through a few things here just to answer any questions that may come up while making this. 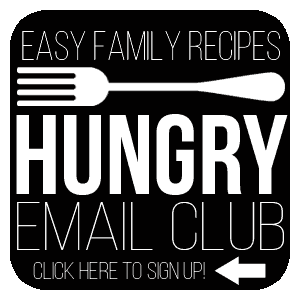 You can find the full, printable recipe card at the bottom of this post. 2 lbs boneless skinless chicken breast- This is about 3-4 normal sized chicken breasts. If your chicken breasts are extra thick, I recommend slicing them in half so they are half the thickness so they will cook more quickly and evenly. 1 can (10.5 oz) Cream of Chicken soup- I use the regular cream of chicken soup. The 98% fat free version is thinner and can be substituted, but the sauce will be thinner over all. 1/2 jar (4 oz) capers- A small jar of capers is generally 4 oz, so you will just need half the jar or 2 oz. If you really like capers though you can add more! 3/4 cup freshly grated parmesan cheese- You can buy a block of parmesan and grate it or buy it pregrated at the store, just don’t use the powdery kind for the best result. 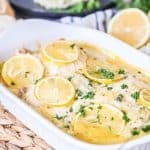 1 lemon, thinly sliced- You won’t eat this but if you have a lemon you can bake on top of the chicken, it adds some extra flavor as it bakes and then makes for a gorgeous presentation when it comes out of the oven! Q: Can I use chicken tenderloins, thighs, or other chicken cuts? A: Yes! Other cuts of chicken will work nicely in this dish. Both chicken tenderloins or boneless, skinless chicken thighs will work really well. The cooking time will most likely be reduced in both cases, so keep an eye on it to make sure it doesn’t over cook. When the dish is done the chicken will be 160˚F internally. Q: Can I make this dish healthier? A: In general this is a pretty wholesome dish. It is protein rich, low calorie, and packed with flavor. I like to up the health value of this dish by serving it with lots of great veggies like sauteed spinach, salad, or other oven roasted veggies. Optionally, you can use a low fat cream of chicken soup, but I think the dish turns out much better with the original cream of chicken. Q: Can I freeze this? A: Yes! You can freeze this either before or after cooking. To freeze before cooking, mix the sauce and place it in one freezer bag, then put the chicken in a separate bag. When you are ready to cook, thaw everything, remix the sauce and assemble and bake as directed. To freeze after cooking, store in an airtight container in meal sized portions and place in the freezer for up to a month. I hope that your family enjoys this dinner as much as mine does! This easy Chicken Piccata Casserole is a hit with the youngest to the oldest in our family! The creamy sauce combined with the tangy lemon and tender chicken is the perfect combination. The best part is that it all bakes in one dish for quick and easy prep and simple clean up! Do you drain the capers? I made this and it was good! I’ve been on a chicken piccata tear after my mother made it Thanksgiving weekend but I wanted to find a way to bake rather than fry plus bake. This was super easy from start to finish and tastes good. My only issue was that it was a little on the salty side for me which is easily remedied the next time I make this. This is a keeper!